Towards the end of our jaunt (or should that be swim?) around the Bird Park there was a building with some incubators and heat lamps inside for baby chickens and ducks. I’ve seen baby chicks a million times, but baby ducks? Oooohhhhh, I’m potty about ducks and was so excited about the opportunity to pet one. 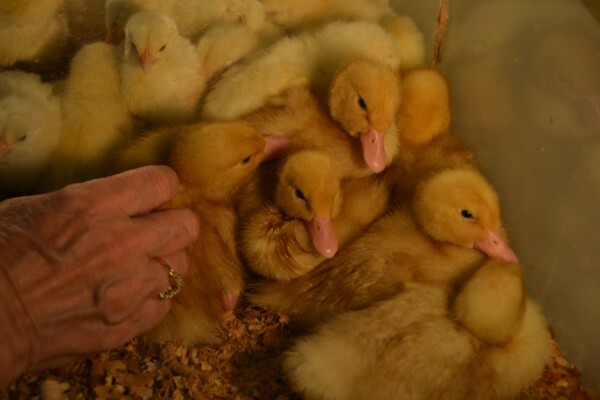 The ducklets weren’t all that excited about meeting me though and tried to huddle away – until I started scratching one little neck and then s/he was mesmerised and it was one of those beautiful moments in life that I didn’t want to end. But it did. David dragged on my arm and we found our way to the exit. From the Bird Park we found a cute little restaurant just outside the gates and decided to eat there. As we entered the waiter asked ‘inside or out?’ and I said ‘inside’. I wish I hadn’t. If we thought the hotel restaurant was freezing well this one was like the south pole in a mid-winter blizzard! We were truly frozen to the bone long before our meals came out and really should have moved ourselves to an outside table but, being us, we didn’t want to inconvenience anyone. Never mind. The meal was exceptionally tasty. I ordered sweet and sour fish which was nothing like I’m accustomed to but truly delicious. David had a noodle-based dish with a ginger flavour that was tasty too but I was happy with my choice. 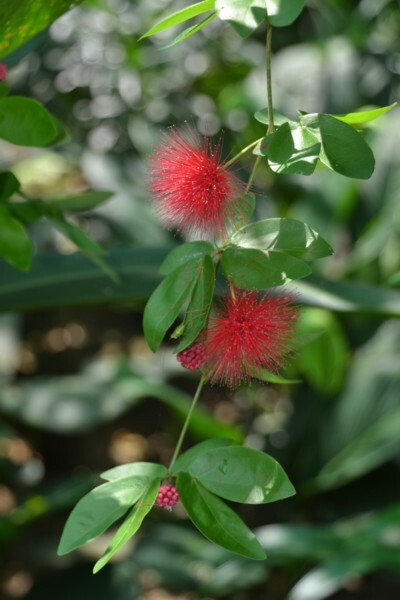 We then continued walking and after a corner or two we saw the orchid and hibiscus gardens sign-posted but the path was up quite a steep hill and we were tired and had defrosted enough to feel hot so decided against it. 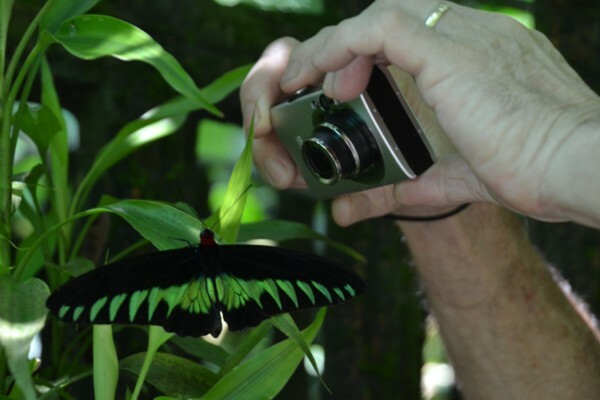 Further on was the Butterfly Park so we popped our heads in there but the lady behind the counter told us that because of the rain the butterflies would not be flying so we decided to believe her and continue on our way. Not a lot to report but we found our way back to the train station by a slightly different route that was a lot easier and got ourselves home before the rush hour started. We didn’t know how cramped the train got during rush hour but dreaded to think! 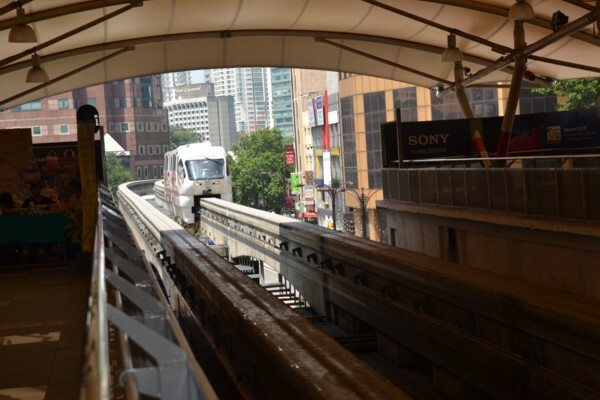 We’d been told before we got to KL not to catch the trains as they were unreliable but our opinion was that they were really good! It had been 1pm when we’d got rained on. By the time we got back to our hotel room it was 5pm and our clothing was still wet. Obviously we settled for a nice shower and some dry clothes and then sat and watched the trafficapades outside the window. I guess now is as good a time as any to show you a photo and a video. The lights had 4 ‘settings’. The street at the bottom right of the picture heading left, which I will call ‘east’ went first (so to speak), then the one coming towards it – ‘west’. Then south, then north. In each direction there were 3 lanes going straight through and 3 lanes to turn right plus a single-lane slip road to turn left. The problem happened each afternoon and evening between about 3pm and 8pm or even later – as I’ve said before. The main issue seemed to be every time ‘south’ got a turn the 3 lanes would turn right and just keep piling across the intersection despite the fact that the traffic on the road they were heading into was not moving! Somehow or another, some of them would even come out of their 3-lane queues and try to nudge in from the sides so you ended up with about 6 cars wide all trying to squeeze into 3 lanes that were stationary anyway. And, as you can imagine, while they were still parked there, the ‘north’ lights went green. These guys would just all aim to their right and, for the lucky, they would weave across to the wrong side of the road and curve back around behind the other vehicles and come into the correct lane for where they were headed. If that was too boring an option then some of them literally wove and threaded their way *through* the cars parked at right angles to them. This involved much honking and reciprocal blasts and amused us no end. Then of course, as is the case in this photo (above) ‘west’ gets a green light and all of those cars get woven in there as well. It was a mind-blowing experience that we never tired of viewing. By the time south got a turn again it was usually clearing. We decided to video it and of course they behaved well to start with but towards the end you start to get the real picture. Note the black double decker bus that comes around when David says “The next change will be interesting!” That’s one of the Hop On Hop Off buses for tourists and more about that later. One night a policeman on a motorbike turned up and did points duty for about 5 minutes and greatly improved the situation, though I still wouldn’t say that order reigned. Then he threw his arms up in the air and left and within seconds it was all back to an unbelievable jumble again. Notice the motorbikes on the ‘east’ all lined up in front of the pedestrian crossing for a hasty getaway the second the lights go green? Or even a bit before if they’re in the mood – and many were! I saw one bike at a red light who obviously thought to himself ‘blow this for a game of soldiers!’ and he turned right across the crosswalk, then across the front of the ‘north’ traffic and then across the crosswalk in front of the ‘west’ traffic and on, in the road next to the kerb but head on against the traffic coming from the ‘south’. 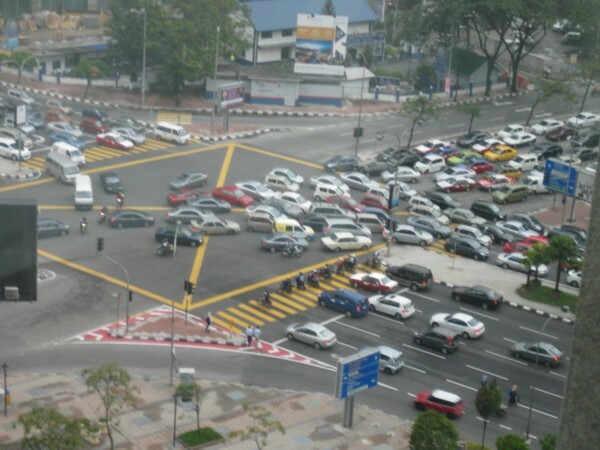 Another time, 3 pedestrians crossed the intersection diagonally from north-west to south-east. We were too scared to use the pedestrian crossings (except for Sunday mid-morning when it was quieter), never mind go through that mayhem! This building made us laugh as we saw it out of our window. 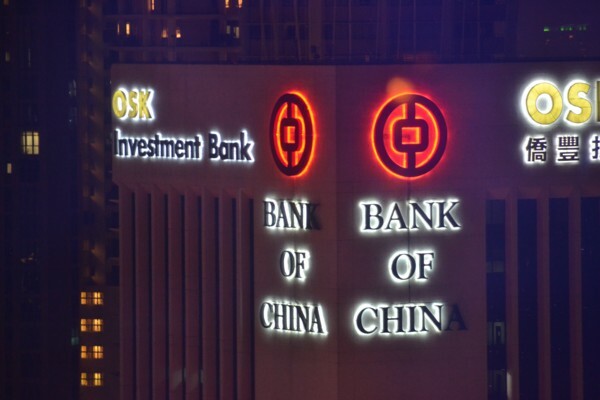 You could choose whether it said ‘Ban of China’ or ‘Bank of Chin’ according to which side you looked at LOL Mind you, each of those letters were 2 storeys tall and they were a good 15 storeys up. Please don’t ask me to get out there changing light globes! After this we spent some more time on Google searching for tourist information and, to be honest, felt really fed up. We had truly expected that the hotel would have tourism brochures or at least be able to organise a trip or two for us! Even failing that, if they’d pointed us in the right direction to the tourist information bureau it would have been marvellous. But all they did was tell us to ask the building concierge and he had no clue either. Tourism is not their purpose in life, I do understand that, but I can’t believe that *none* of the businessmen ever want some tourism information! We considered catching the train to Batu Caves where there was a 272 step climb up to the temple cave but, having read in the newspaper that morning that they were expecting over 100 mudslides this year, and seeing on Google the sheer cliff face behind the Batu train station, we decided against this. 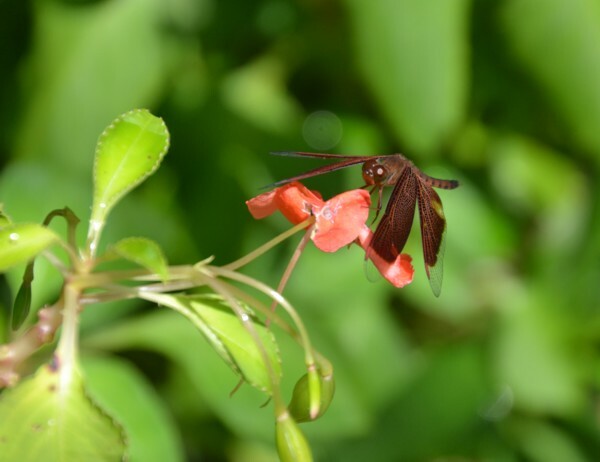 We considered a fire-fly viewing river cruise that a friend had strongly recommended but it was far out of the city, and recommended an overnight stay. How on earth would we get there? We just wanted an organised tour that we could get on and relax while they took us there and back. Really fed up. With the lack of tourist assistance anyway. 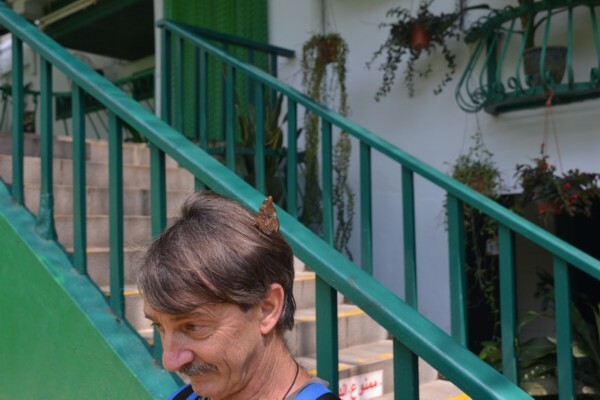 We settled on catching the train back to the Butterfly Park. We watched the traffic some more and then started peering at the building over the road (over the ‘south’ road) and started to wonder if the ‘Deluxe KTV’ sign on the outside may not mean ‘Kids TeleVision’ as I’d guessed. There was certainly a McDonalds and a Pizza Hut over there so we thought that we’d go over there and explore just for something to do. Imagine our surprise, after going through the underpass which contained the train station and some clothing stalls/shops, when we discovered that ‘over the road’ was a shopping centre!?!? We found a shop that sold ladies undergarments and David pushed me in because I hate shopping for underclothes about as much as he hates buying any clothing, but I’m happy to say that the girl in there was so helpful, friendly and efficient that I not only bought some items but am still happy that I did. And then, even at that time of the night, we chose the underpass rather than the crosswalk to come back to our own side of the road. I haven’t said, so will mention it here – the underpasses and train stations were totally spotlessly clean. No graffiti, no dirt, no rubbish. In fact I think we only saw one bit of graffiti the whole week. We frequently saw staff around the place cleaning things. We frequently saw them taking a break too but they were definitely efficient between times! And there seemed to be plenty of staff everywhere. Two or three people to every job where, in Australia, you’d only have one running around frantically and at their wits’ end. To the left of our room window was a building site and David suddenly laughed and pointed at the crane saying “Check that out. I swear it’s a painting on the front window of the crane!” And I would swear he was right. 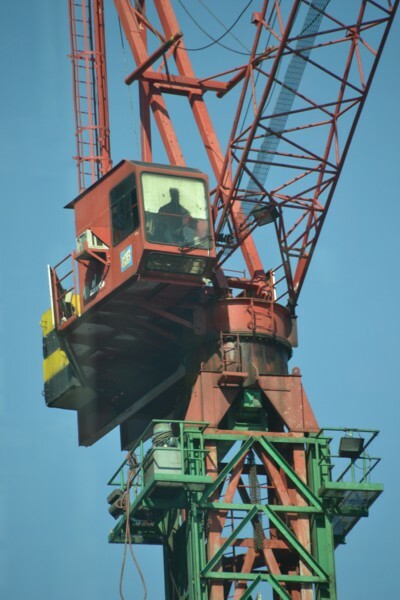 As the crane turned the view didn’t change – the perspective on the driver (do you call him a driver?) stayed exactly the same. It does look odd doesn’t it? And at the end of the shift a movement below caught our eye and all of the men, and one woman, were using either their hard hats or buckets to pour water over themselves and were washing themselves from 4 huge drums of water. They were using shampoo and everything. Fascinating! They remained decent I must add!!! Having had a main meal at lunch time we decided to go into the food hall that we’d noticed a sign for in the basement of our own hotel building. We hadn’t seen that sign until the 2nd day either LOL Now just to mention that we had expected to be absolutely smoked out in KL. In Perth the percentage of Asians that smoke seems incredibly high so we were prepared for any horrors, including smoking in restaurants, but had been happily stunned that we hardly came across any smokers at all. This food hall though was the exception, despite the fact that there were very clear ‘No Smoking’ signs at regular intervals throughout. And of course, being in the basement, the smoke just sat there. Yuk! We wandered around and settled on a Subway roll and, other than having to choose a different flavoured bread, had our favourite that we’d have chosen at home. Needless to tell you we did not eat it down there in the tobacco fog but took it up to our room. I coughed all night long and kept both of us awake. What we needed on this holiday was lots of glorious rest and sleep but life was conspiring against us on that front. After breakfast, as planned, we caught the train to the Butterfly Park. 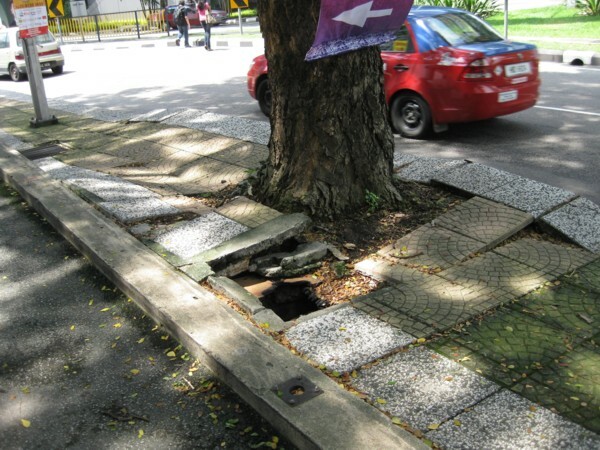 Here’s one of the kerbs along the way to show you the height of them. You can make out the motorbike but not the guy sitting on a seat next to it, slumped sideways across the bike seat/tank fast asleep! We found the park easily which was so nice after the difficulties we’d had to date finding things. We’d hoped it would be as wonderful as the one on Sentosa Island in Singapore but it was a completely different experience. It wasn’t bad, it was just different. This one was more like a garden with little features such as a small water fountain and a turtle pond, and the butterflies just fluttered around and could be hard to find at times. We began to wonder if we should have come in yesterday after the rain when they weren’t flying after all. But after a while we seemed to settle into the way it was and did get some not bad photos. I really loved this butterfly. 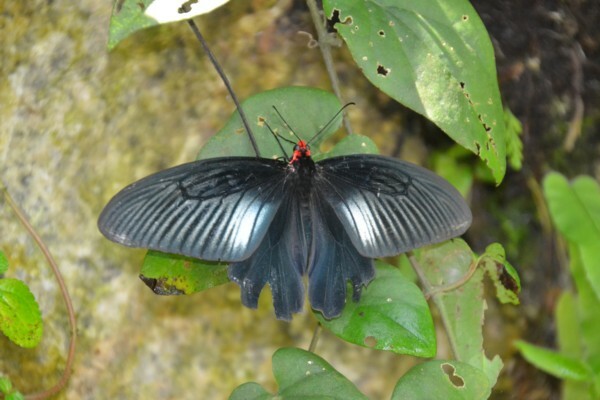 The green parts of its wings looked like tiny leaf tips and would be a wonderful camouflage! The Butterfly Park also had some fish, frogs, lizards and other such things in small tanks which were interesting. And one very pretty flower. Then we were done and decided to go to the loo before we left. 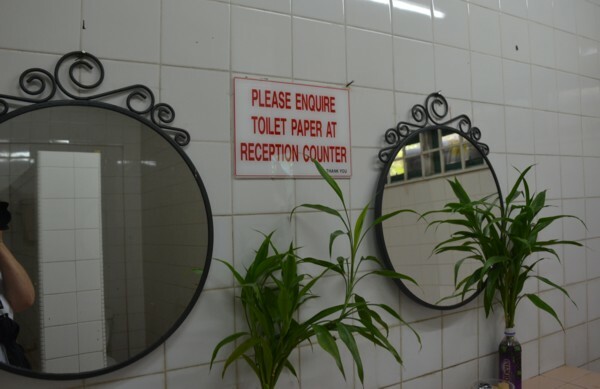 Just inside the ladies – I can’t add ‘door’ to that because there wasn’t one – were 2 mirrors over the hand basins and between the 2 was a sign saying ‘PLEASE ENQUIRE TOILET PAPER AT RECEPTION’. Note the classy plastic Ribena bottle ‘vase’ ROFL. I shouldn’t laugh because the greenery honestly was pretty. Actually, perhaps I should have perfected the art of using greens as toilet paper because many toilets *did* have those! If I hadn’t already learned to travel ‘equipped’ I’d have been in for a long walk up a flight of stairs, through 2 rooms of showcased, gigantic insects, and a long meander through the shop to even find reception! Is this a national vendetta against the alleged minority group that require toilet paper or what? There was one squat toilet and one western one and the floor in the western one was an inch deep in water and I didn’t want to begin to think where that water had been sprayed, nor dripped from! Needless to say the toilet seat was swimming in water also. Needless to say, this simple and easy task took me 4 times as long as it took David! We now viewed the insect displays in the aforementioned 2 rooms which stunk of mothballs. Some insects were alive and some, thankfully, dead. Humungous beetles, spiders and cockroaches being the ones I was grateful to see stationary forever! But then further along were the butterflies and moths, which I think were the reason for the mothballs. Do moths *really* indulge in necrotic cannibalism? In the shop was a really pretty cotton shift-style dress but it was 59 ringits. I don’t think so! We took this as an indication of the other prices and hurried through. From here we wanted the monorail and it looked fairly easy on the map but ended up being quite a complex walk involving lots of those high kerbs, and roads with not much to walk on along the sides. It was quite warm so we stopped twice to drink some water and once to take a photo of the footpath. This one was the biggest mess yet which was a shame because it gave you sufficient warning to watch your step before you could hurtle down the gaping drain hole. Unless you tripped and went down it head first. Perhaps that was their game? Eventually, after using a footbridge to get across a busy road we came to another footbridge to go back across the same road and up into the monorail station. We could not have stayed on the same side of the road as the footpath had run out. As we climbed up the steps with our weary legs David looked over the side and laughed. What had first appeared to be a block of land covered in greenery was, in fact, just that. 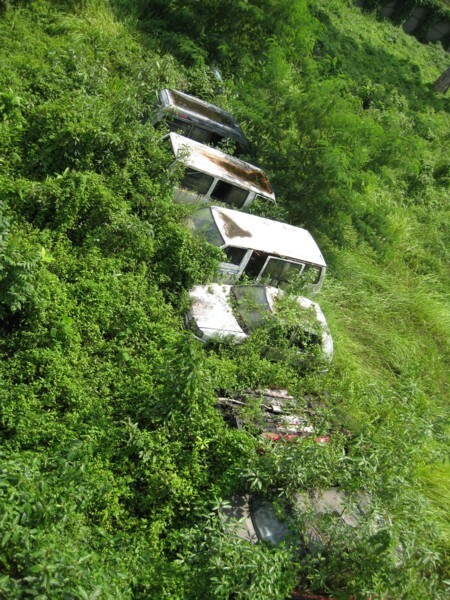 *But* in between some of the masses of leafed creeper covering it all were some cars with their rooves just barely visible. The monorail wasn’t what we’d hoped for. It was crowded, which is fair enough – if they don’t get customers they can’t afford to run – but the disappointment was that the windows had lots of thick-painted advertising on them so it was impossible to take photos as we rode along. It was almost impossible to see out! Perhaps surprisingly, the monorail did actually have a driver though. We got off at the stop for our favoured Sungei Wang Plaza and looked for the huge pasta restaurant that we’d seen there. Honestly, I just wanted to sit down for a while before we ventured out on our next excursion but we could not find the pasta place and ended up, pathetically, settling for an iced tea on the upper floor, perched precariously on tall bar stools with 4 different kinds of music blaring loudly at us from nearby shops. The noise was doing my head in by about half way through the tea. It must have been murder for David! We scurried down a set of stairs in a silent glass-walled haven, glad to be avoiding the shops that we currently did not wish to see. We went on a little beyond Sungei Wang looking for the electronics specialty shops that we’d heard about and found Imbi Plaza. Trust me, this was *not* the answer to our dreams. 3 floors high this small and very old collection of hovel-like ‘shops’ was full of mobile phone vendors or places that appeared to pull computers apart and split the components into various cluttered piles; nay *heaps*, filling every centimetre of space inside so that you could imagine the stall holder needing long and strong kitchen tongs to reach to grab things they wanted. One day one of them will place a single item too many in a stack and be buried alive! The stall holders looked rather sideways at us and did not offer us their wares. They knew better than we did that we were in the wrong spot. Lastly, we went down some escalators to the bottom floor and found ourselves in a large and much neater shop but it was still not what we wanted and we scurried away as fast as we could. The only way out of this shop was up some stairs – we’d been electrically escorted by escalator to get down there but had to use our own leg power to get out – and these stairs unceremoniously dumped us out in the street at the back of the ‘shopping centre’ (I use the term loosely). Wandering around a bit down a very narrow laneway, and risking our lives from the cars coming along, we saw the back of another shopping centre and, having looked at the map, I told David that this was the one we wanted. But would he go through the doors? No. And why not? “Because everyone else is going this other way” Well that’s one way to make me cheesed off! We followed the outer edge of this shopping centre and crossed a very busy road and found ourselves at the back of beyond and at last David accepted that we needed to go back the way we’d come. Oh well, he’s pretty perfect in most other ways and we all have our moments. Finally we were in Low Yat IT Plaza and this really was the right spot. Again with the mobile phone outlets, computer and camera shops, but this time they were clean, bright and modern. We asked in 2 camera shops about a lens adapter for Dan but they didn’t have what he wanted. Just a bit further there was a sign saying “Prime toilets” with an arrow so we decided a pit stop was in order. Following the arrow we went down a laneway about 3 shops long and, you guessed it, no loos, prime or otherwise. Back to the arrow to check we’d not been mistaken but it certainly pointed the way we’d just been! Sigh! We got out of there and just walked, not really aiming in any particular direction, and came across an undercover paved walkway along the side of some restaurants and pubs. There was another sign here for toilets ‘for the use of shoppers only’ and we went down the sloping ramp towards them. David made dubious words about the likelihood of them being usable but I tell you what; they were definitely some of the better facilities I’d seen! He’d carefully stood guard outside the glass outer door in case I’d screamed ‘help’ bless him! I came out giving a giant thumbs up. There had even been paper and a dry seat and I’d reached the point where those 2 things equalled heaven. As we walked along there was a nice young man (OK, he was actually quite hunky) who wished to show us his menu so we took a look and decided yes, we would have some very, very late lunch. David asked for a beer and I got a very tasty fruit cocktail and we ordered one serve of fish and chips to share. It was a bit warm for wanting to eat a whole serve each. The restaurant was named D’Spice and I would happily recommend it to anyone. Friendly service and a really nice atmosphere, along with good food, after being able to choose from a really varied menu. Very nice. We asked advice as to where we were but the waitress, with a European accent, told us that she was new there and didn’t know so we just did our best and aimed in the direction that we felt was right. At this point in my notes, and perhaps surprisingly seeing as we’d just had a nice drink, meal and loo stop, I must have been feeling rather fed up because I’ve written. We successfully walked home, by an amazingly direct route, as moderate rain set in, and I settled on a snooze after such a sleepless night and still not feeling the best. David checked his emails and did some tourism Googling while I was down and out for an hour. When I woke up I was still coughing so David went over the road to see if he could find a chemist and get me something so that we’d both be able to sleep this night. Even allowing for him going down the underpass and searching for a chemist within the shops he was gone a really long time and I was starting to get worried. 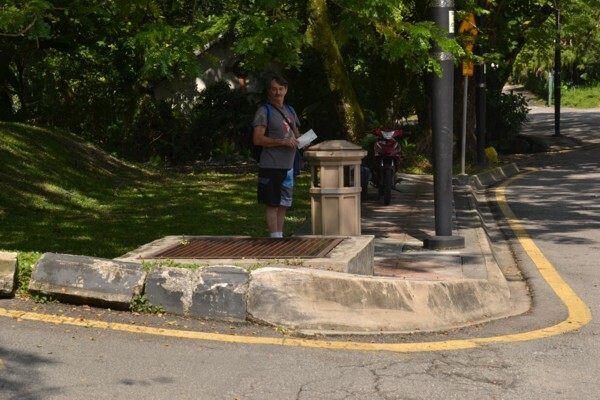 He had nothing on him to show where in KL he belonged in case of accident. Eventually and thankfully he arrived back and had got me some ‘wet cough’ medication. What I had was definitely a dry cough, bless him! However, it worked really well. I’d really hoped that he would bring a Pizza Hut back with him but he’s not a mind-reader so that didn’t happen. We knew there was nothing else over the road that we fancied – in fact there was one Malaysian restaurant that literally stunk to high heaven and we’d hold our breath to walk past it! We discussed getting room service but David said it would be cold before it arrived so, too tired to go out exploring to find food elsewhere, even if that was possible close by, we sat and ate our bag of chips each that we’d bought on our grocery shopping day and fell into bed at 8pm dead on our feet.